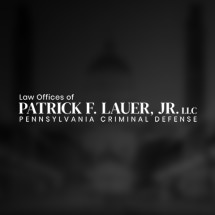 The attorneys of the Law Offices of Patrick F. Lauer, Jr., are dedicated to aggressively representing individuals charged with criminal offenses, complex bankruptcy issues, family law matters, and serious automobile accidents. Free initial consultations, payment plans, board certified attorneys, present the experience and flexibility needed to represent every client well. You can contact our Attorney, Patrick F. Lauer, Jr., Esq. to discuss your case. More information may be obtained at www.dui-pa.com. If you are charged with a DUI, Attorney Lauer dedicates a substantial portion of his practice and experience to defending individuals accused of driving under the influence of alcohol. He has been board certified as a Criminal Trial Advocate by the National Board of Trial Advocacy.